Another day, another indie bundle - two of them, in fact, neither of them "Humble" but both pretty sweet. More indie bundles! Could we ever get tired of talking about these things? Well, yes, actually, and at some point we're going to have to draw the line but for now it's the holidays and so we glumly soldier on, because that's the sort of stand-up dudes we are. And today we bring you word of not just one but two indie game collections, each one served with a special twist that will make your life better than you ever dared imagine. First up, the Indie Royale Xmas Bundle, including The Blackwell Trilogy: Remastered, Eets, Dino D-Day and The Oil Blue, which isn't available in a "pay what you want deal" but is so ridiculously cheap that it hardly matters. The bundle is currently going for a minimum of $3.15, which for the mathematically challenged out there is less than a buck a game - a tough deal to beat. And everyone who kicks in more than the minimum [starting at $10] pushes that minimum price down for everyone else. But the longer the bundle is on sale, the higher the minimum price goes, so if you want to get it cheap [and you're not interested in doing a solid for your fellow gamers] you'd best be grabbing it quickly. 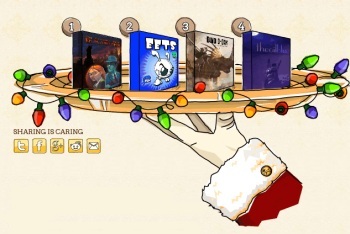 Next in line is the Intermediaware Indie Game Christmas Bundle, featuring Captain Backwater, Absolute Blue, Temple of Tangram and Psychoballs. This one is a "pay what you want" deal [but don't take that as encouragement to be cheap] but what's really cool is that when you buy the bundle, you can enter email addresses for your friends and on Christmas Eve they'll get the games too. That's right, you get to pay what you want for the bundle and then gift it to as many people as you like. Where I come from, we call that a serious bargoon. A couple details of note: anyone who drops enough to force down the price of the Indie Royale Xmas Bundle will get Rush Coil's 8-Bit Christmas chiptune album as a free bonus, while forking over more than $6.99 for the Intermediaware Indie Game Christmas Bundle will net the official soundtrack [for the whole bundle, I guess] in MP3 format. As you might have surmised, both the Xmas Bundle and the Christmas Bundle are only on sale until December 25 - you might want to mark that on the calendar.